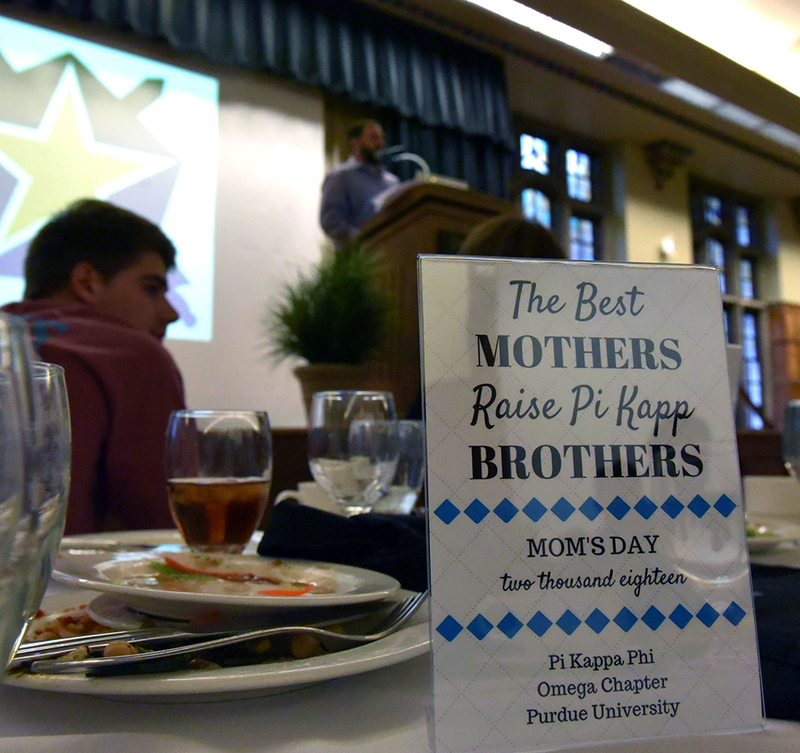 Nearly 300 people participated in Moms Day 2018 at the chapter on April 14. 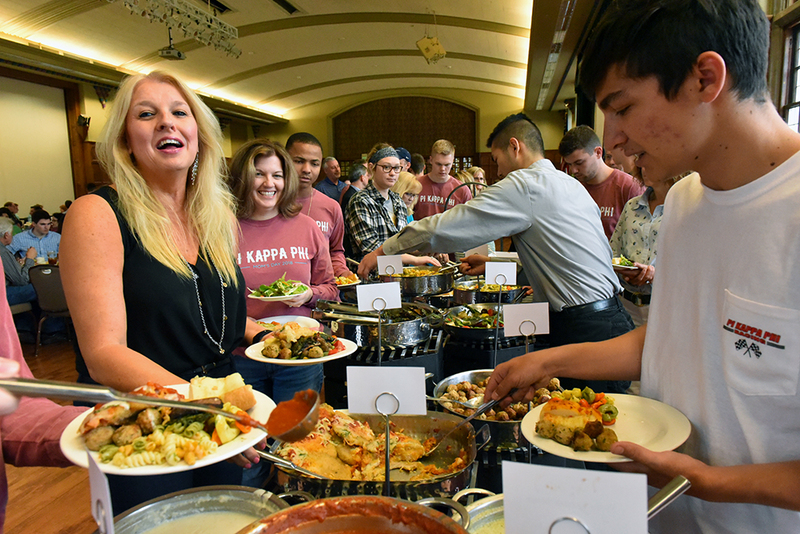 Activities included the arrival of the 19th Annual Pi Kapp 100, a charity auction and an evening banquet. The Pi Kapp 100 team, consisting of 28 riders and crew, fought early-morning cold and rain, to complete the 100-kilomter ride to campus around 12:45 p.m., Saturday. 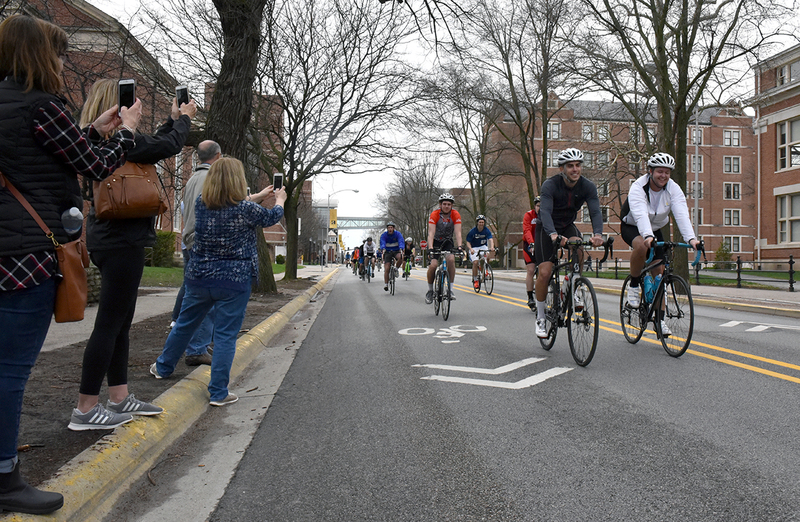 Riders included Ability Experience CEO Basil Lyberg, chapter alumnus and national AE staff member Mike McBride along with all nine of the chapter’s 2018 Journey of Hope cyclists. 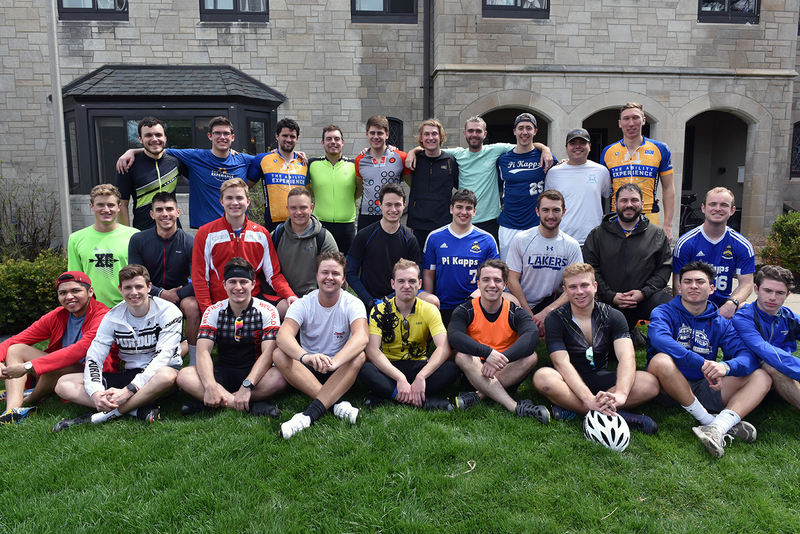 Also, five fraternity members from four different chapters participated as part of their regional training for summer cycling events for national fraternity. 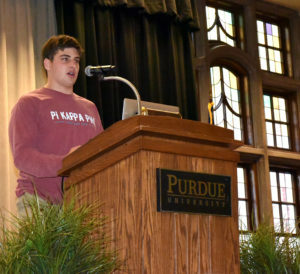 2018 winner of the RB Stewart Award as Purdue’s top fraternity. 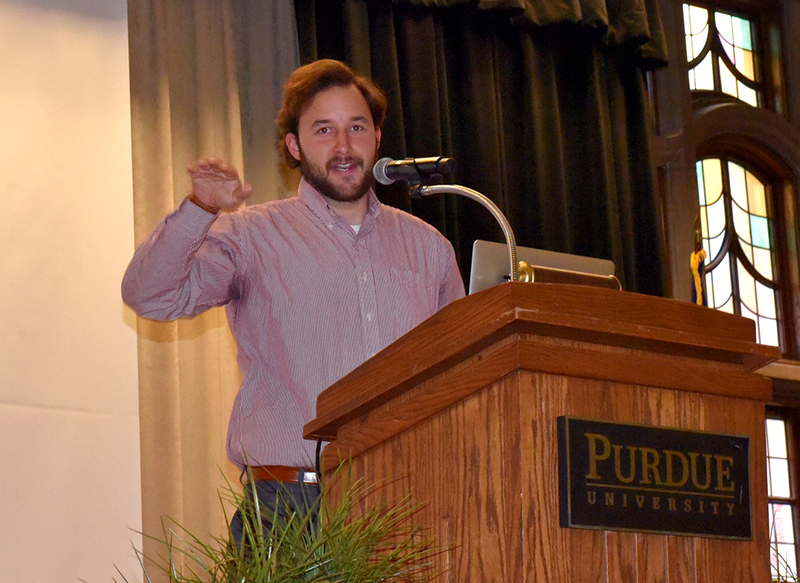 Journey of Hope alumnus Drew Rudman talked about his experience riding cross-country as well as the various things the chapter does in service to others. Mary Moeller, mother of two Pi Kapps, talked about her love for the fraternity and its outreach programs. 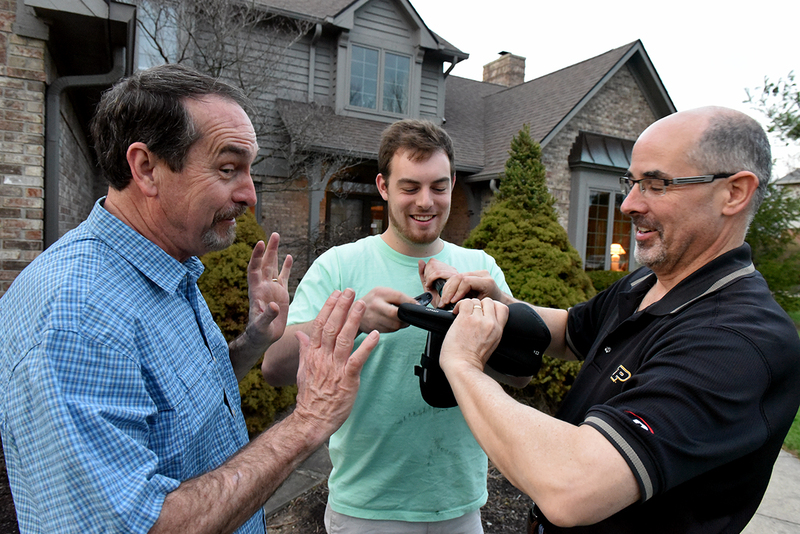 Her oldest son, Erik, and youngest, Jacob, have been members of the chapter. Her family has hosted the TransAmerica Journey of Hope team for each of the last six years and will again in 2018. “There is a six-year age difference between Erik and Jacob,” she said. “Erik never pressured Jacob to join Pi Kapp. He wanted Jacob to make his own decision – be his own person. I was thrilled when Jacob said he was pledging. 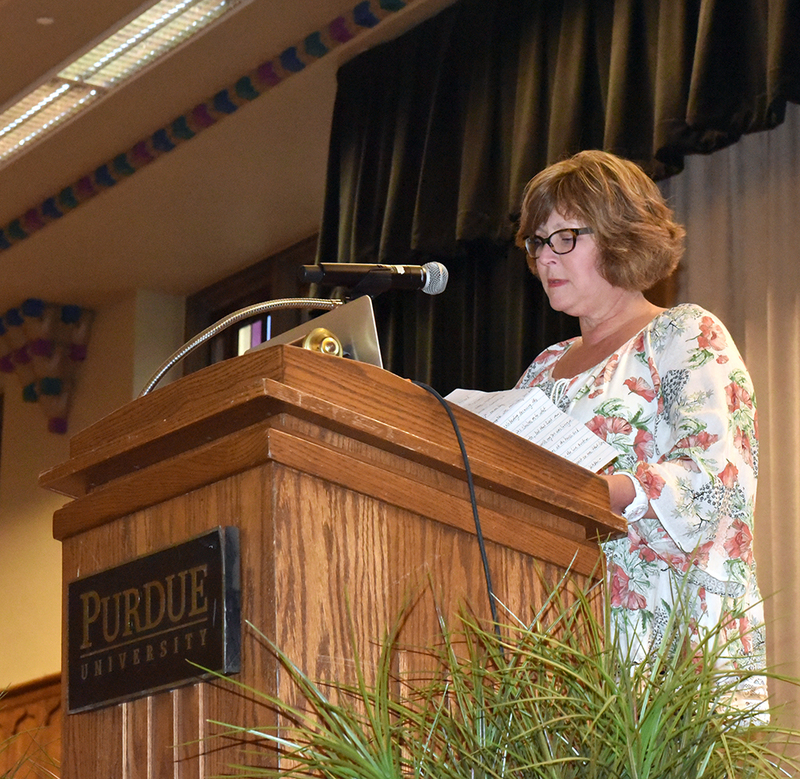 And keynote speaker Lyberg, lauded the chapter’s outreach for people with disabilities and presented a $6,500 check for Lafayette Jefferson HS to support the special needs program there. Ability Experience CEO Basil Lyberg speaks to the 2018 Moms Day crowd that exceeded 250 people. 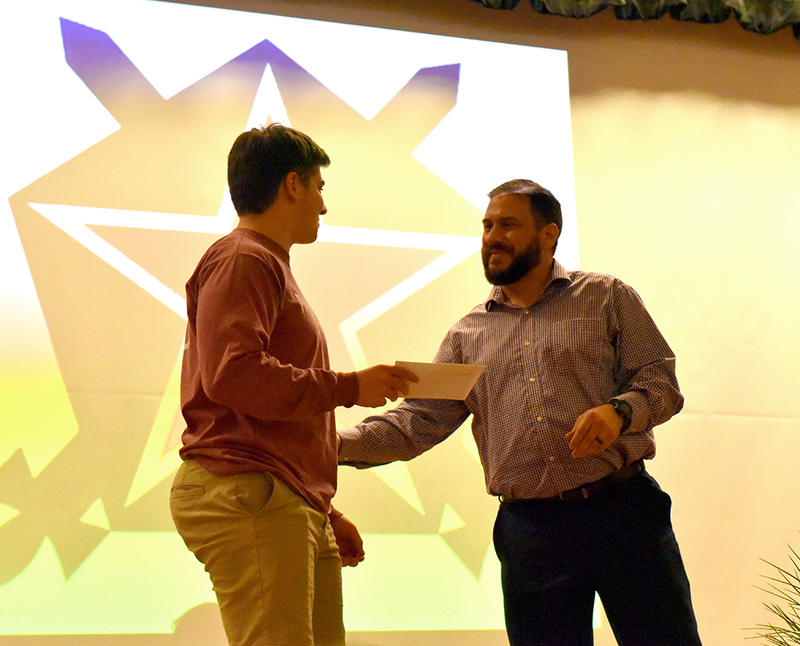 The Omega chapter of Pi Kappa Phi came off of a very successful year in 2017 and we are continuing to grow thus far in 2018. No. 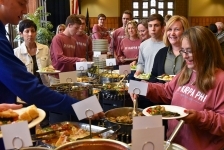 1 in philanthropy dollars raised for AE, $112,354 in the fall semester (chapter fundraising, JOH, PUDM) (full year was more than $126,000), fall semester No. 2 raised one-third of our total at $38,000. No. 1 in service hours with 5,040, over double second place. No. 2 in average GPA with a whopping 3.26 chapter GPA (No. 1 has only 26 members). No. 6 in chapter size with 145 members, average is 86. We have won numerous national awards at Pi Kapp College for Chapter Officers this January, including the Star of Hope award, for the best overall contribution for the Ability Experience. And, finally, just five days ago at the Purdue Greek Gala, the Omega chapter was awarded with the RB Stewart award of fraternal excellence, given to the best overall chapter at Purdue. We have won this award 8 of the last 11 years including 2 of the last 3. The presenter even jokingly suggested that they rename the award after us. We are so grateful for everything these members are able to accomplish, bettering our community and bettering ourselves as men in the process. I’d personally like to thank all of the moms and families, either with us this evening or not, for raising such a great group of young men. Hello everyone and thank you for again for being here. 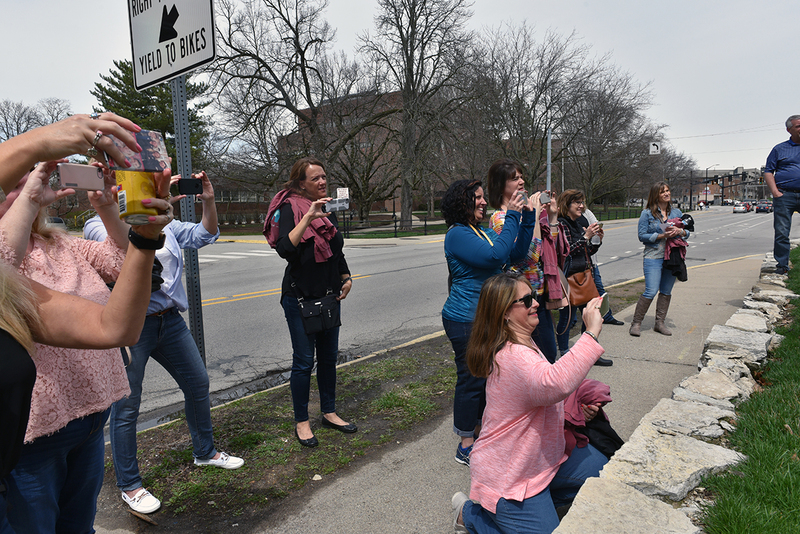 Whether your trip was across town or across the country, all of us in the chapter are really happy you were able to make it safe and sound to celebrate and enjoy such an awesome day and weekend. For those of you who don’t know me or didn’t hear Jack Kellison introduce me because you’re still in a food coma from that awesome dinner, my name is Drew Rudman. I’m a fifth year here at Purdue and am studying chemical engineering; who knows if that’s what I’ll do down the road, but for now I like it. The rest of tonight, if you didn’t already get a sense from Nate Longo’s speech, will showcase a lot of what makes this chapter such a special one to be a part of. However, today in and of itself, is such a cool picture and testament to that fact. To be able to have this many people come together and to have this space we’re able to host an event like this in and to have such hardworking and dedicated people like Pat and our executive team that are able to plan something like this … year after year it’s an incredible thing to witness. Two years ago, on this very weekend the stage was set for me to start to gain a picture of just how unique of a situation this really is. 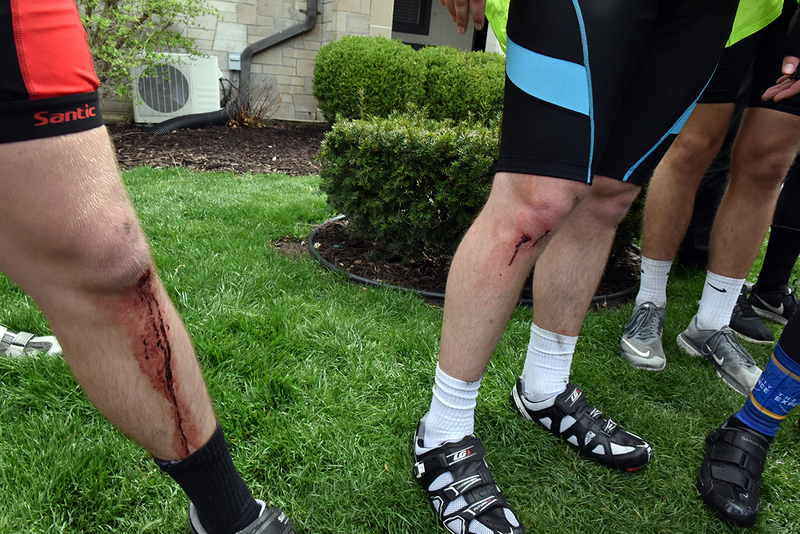 See, I was signed up to be a rider that summer and would be biking on the TransAmerica route. When I stepped onto campus in August of 2013, I ended up finding my way at several rush events of multiple fraternities; mainly because free food is my love language and college was like a dream, except it was real life, in terms of being able to get free food at any club or organization callout. That changed pretty quickly after hearing about the Ability Experience and the wild idea and trip that Journey of Hope is. Soon after, I thought to myself before saying out loud, “I’m going to go to more of these rush events and if I’m lucky enough to receive an invite to join: I’m going to do Journey of Hope.” I swear that is the way it happened, which is pretty awesome in hindsight, but a little ridiculous for a person to say that “ran” a mile in fourth grade at a lightning 16 minutes and 32 seconds; I’m not exactly a physical specimen on the caliber of the world’s best athletes and biking across the country seems like it might be a little involved. Despite that, it eventually worked out and in the summer of 2016 I made my way from coast to coast. There were about a million moments that I could share with you all today along the same thread as the one Luke shared two years ago, but to me, one sticks out among the rest and gives me great joy to think upon. Our team was traveling to the booming metropolis of Pratt, Kansas from Dodge City. I don’t know if any of you have ever been to Pratt, but it was my first time. I had a frustrating, difficult day on the bike where I was exhausted as the day began and in biking and we were lucky enough to experience a nice headwind for most of the day. The spread between all of the pace lines was huge and we came to our Friendship Visit for the day in Pratt feeling defeated. As we sat in the main room, the person in charge introduced us to Arrowhead, where our Friendship Visit was, and what their involvement with Journey of Hope and the TransAmerica team had looked like in years prior. 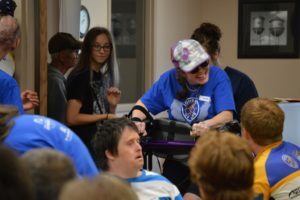 It’s hard to recreate moments for others to live in and experience with you, so I brought a picture from this friendship visit and Jodi as she walked out, using the adaptive walking equipment that the owner talked about. I sat absolute speechless and also overjoyed. 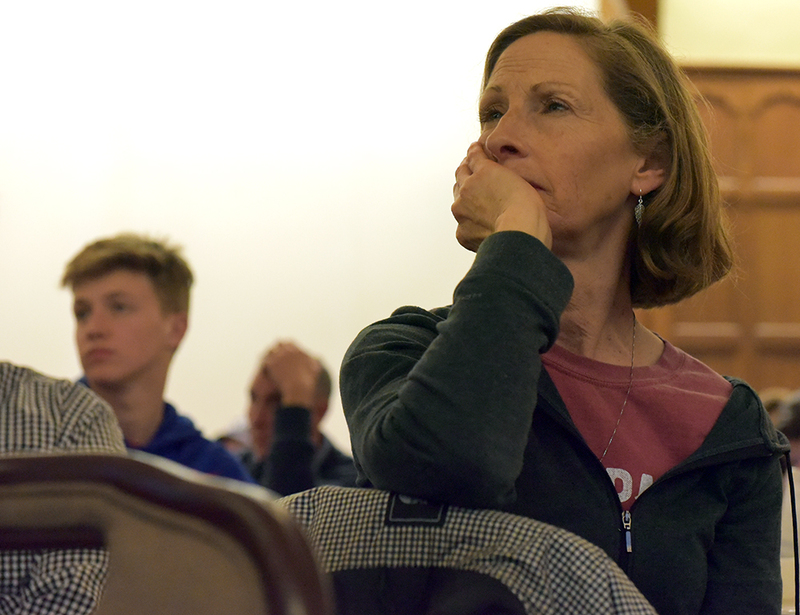 The feelings of disappointment from biking were shifted to a deeper understanding of why we bike: The bike is our way to model the trials and difficulties so many other people experience. The difference? 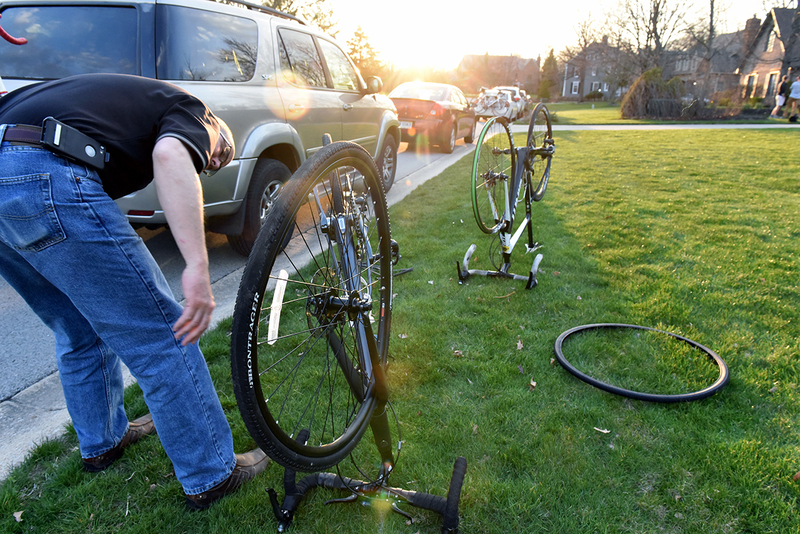 At the end of the day, we get to get off our bike, and most people don’t get to. This dramatically changes the way you begin to think and carry yourself when you meet someone like Jodi or Zach or Alan from St. Louis that love the heck out of life, because they understand we may be hindered in some ways, but they pale in comparison to the limitations we can free ourselves from. The Journey of Hope and the Ability Experience have been paramount in my development as a man and growth in sympathy, empathy and compassion. It has shown me what it looks like to care for others, walk in joy and bridge gaps between people who appear to be very different from you … but actually have so much to say about your life and teach you. It showed me the vast array of limitations I place on myself and hinder my own growth as well as what I have to offer. Anyone who trains for Journey of Hope will be rudely awakened as the first two weeks play out because it’s not something that can be simulated. But I think that truly speaks to all those who are Pi Alphas, that attitude is transformative. Any Pi Kapp who wants to do Journey of Hope can because you meet so many people along the way who redefine what ability truly looks like. Warriors and legends that fight on the daily to accomplish so much more than biking a few thousand miles could ever compare to. 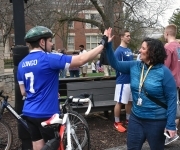 The Journey of Hope gives you a look nationally as a Pi Kapp to the reach of our fraternity and philanthropy, but on campus we have numerous events that happen every year as well. From Arctoberfest where we have a Halloween party with an organization here in Lafayette, to our 72-hour Bike-a-Thon during Homecoming week in memory of David Feltner, to War of Roses, which is a talent show for sororities on campus, to the partnership we have with a special needs classroom at Lafayette Jefferson High School …the Ability Experience impacts so many right here at Purdue through this chapter. I’ve loved being able to play a role in all of these events and to see them grow and change and be molded as new guys with new thoughts and new abilities come in and make them their own. As you become more and more familiar with our philanthropy you understand it teaches you to hone in on your own giftings and talents and to share those with others, but also to be quick to listen and slow to speak to learn from those around you who also have much to give. This fraternity and philanthropy and specifically Journey of Hope changed my life and it’s crazy to stand here before you all and say that and know it will be true for so many more people in the years to come. To recognize the changes that have already taken place in those present today, I’d like to ask those of you who have already ridden or crewed JOH or will this summer to stand and stay standing. 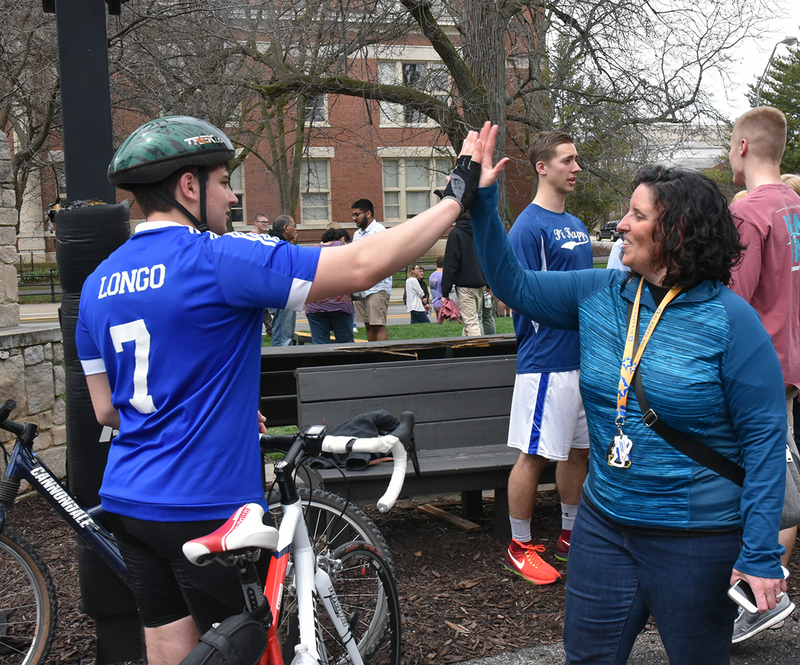 I’d also like to ask all of you who were involved with any of the events I mentioned that happen on campus from Arctoberfest to Bike-a-Thon to stand. Look around you and I hope you see a multitude and variety of talents that will continue to move this chapter forward, along with this campus and one day the communities in which you all call home. There’s power in numbers where the walls and barriers and limitations we ourselves and others put up can be broken down … and luckily, we don’t have a short supply of guys to start taking down some dry wall with. My experience with this chapter and philanthropy and Journey of Hope have been filled with more moments than I have been able to keep count of, which made it all the easier while biking in mountains and heat to be reminded of the sweet people I have met as an extension of our philanthropy and my own abilities and bring smiles across 4,000 miles. This is my favorite day! 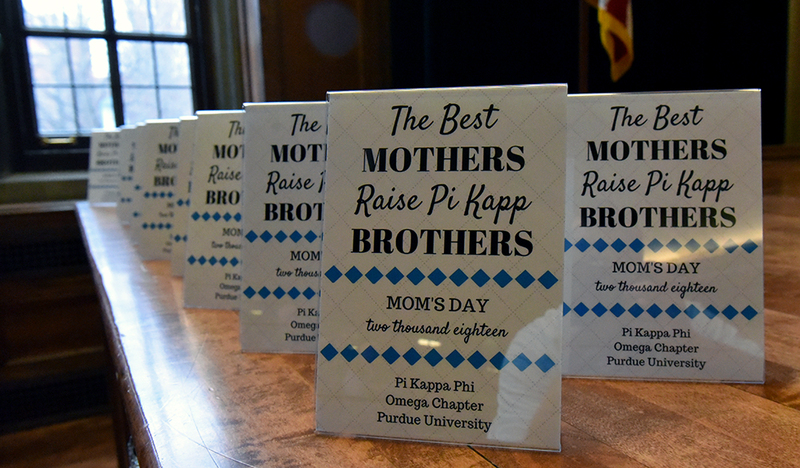 I am blessed to be a two-time Pi Kapp mom. My oldest son, Erik, was a spring 2011 pledge, graduated in 2014. My youngest son, Jacob, is currently a sophomore. This is my sixth Moms Day. 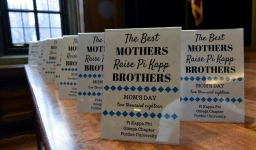 My introduction to Pi Kappa Phi was Moms Day 2011, and like today, we were celebrating receiving the RB Stewart Award. I was clueless as to what Erik had gotten himself into, but that first Moms Day connected me to the world my son was living. Pat cooked lunch for the moms at the house and I won Jimmy Buffet ticket in the live auction. But what had the biggest impact on that day – other than Pat’s prowess in the kitchen – was the video conference call from the then CEO of Push America Chad Coltrane, now The Ability Experience. 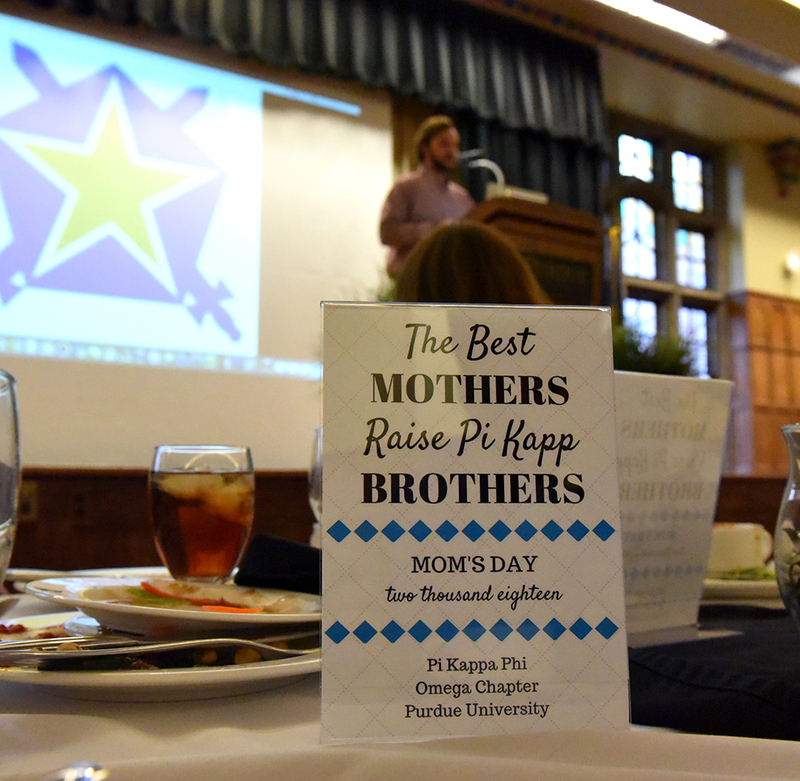 He called to congratulate the chapter for receiving the RB Stewart Award, talked about Push America, the Journey of Hope, serving people with disabilities and how awesome Moms Day is at Purdue. He was so sincere and proud of the accomplishments of this chapter. 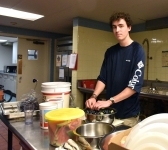 After the weekend, I felt the apprehension of my son being in a fraternity completely disappear. I also realized I had a whole new vocabulary to learn … Chapter, pledge pop, JOH, Friendship Visit. 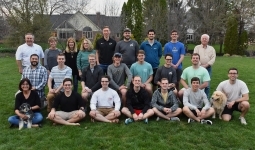 This chapter takes its philanthropy, the Ability Experience, seriously and I encourage you to check out the website to see the photos of the activities your sons are taking part of. Also go the Ability Experience website. It was fitting when Erik called and said he wanted to the Journey of Hope. 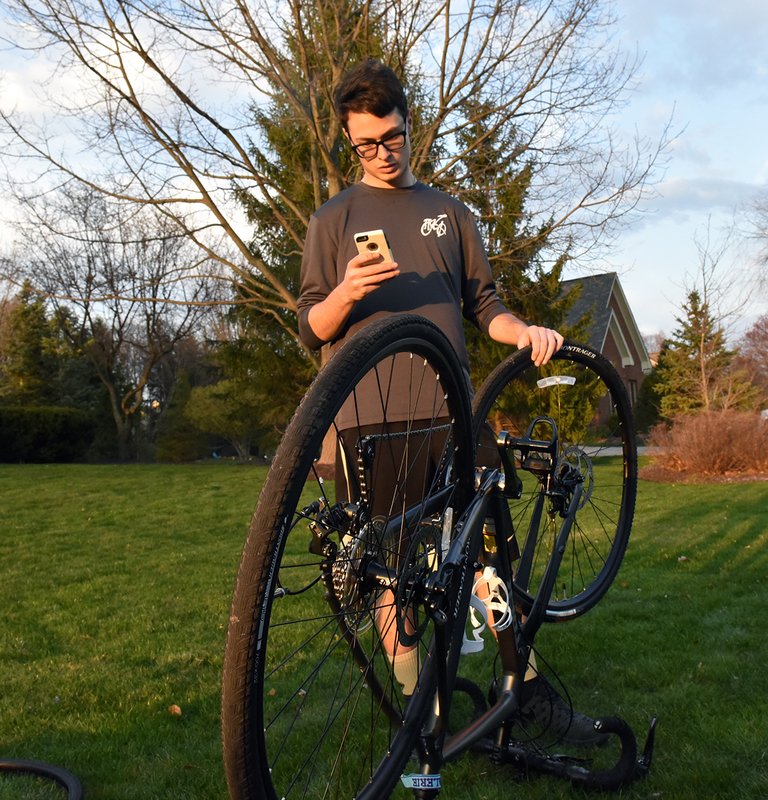 He missed the deadline to cycle, but was able to sign up to the crew team. Summer 2012 I bought myself a plane ticket for him and a map for me and followed the team. Every morning I would put a dot on the map indicating their destination and distance. Erik spent a lot of time sitting in the van waiting for the cyclists, so he would call and tell me about his days, the team, the Friendship Visits, what they ate and where they slept. If felt I knew each of the team members personally. We got to meet them when we hosted dinner as they traveled through Indy and were in Washington, DC, when they arrived. That summer had a profound impact on ME. I followed these young men daily as they selflessly cycled 75+ miles a day to bring joy and happiness to a group of individuals they didn’t even know and then turn around and do it again and again. 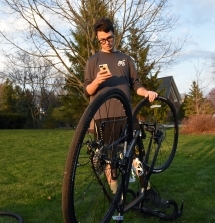 We were driving home from Washington, DC, maybe in Maryland when Erik said, “I want to ride next summer.” He took his stipend from the summer and bought a bike the next week. 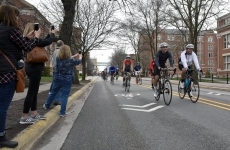 He was put on the same route – TransAmerica – from the previous year. Summer 2013, I bought a plane ticket for Erik and a map for me, but this summer was different. I was excited, but not apprehensive. 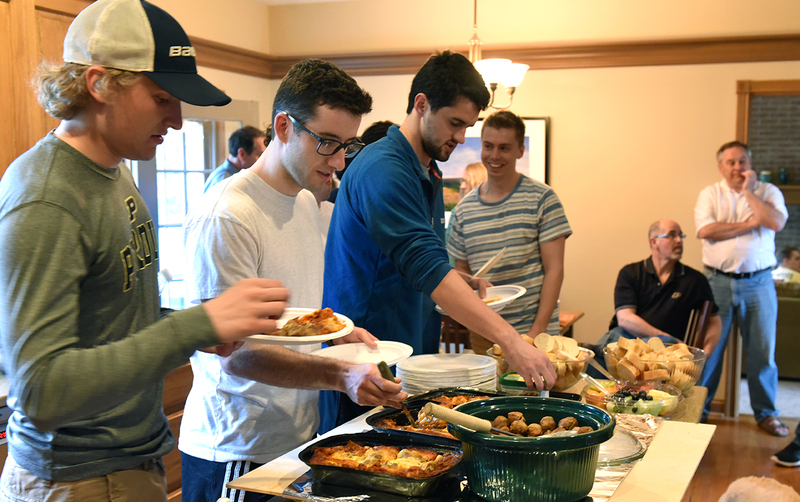 We hosted the team for dinner when they came through Indy and were in DC for the arrival. We have hosted the Trans team for the last six years and will again this summer. Jacob has been involved with Pi Kappa Phi before he became a Pi Kapp. 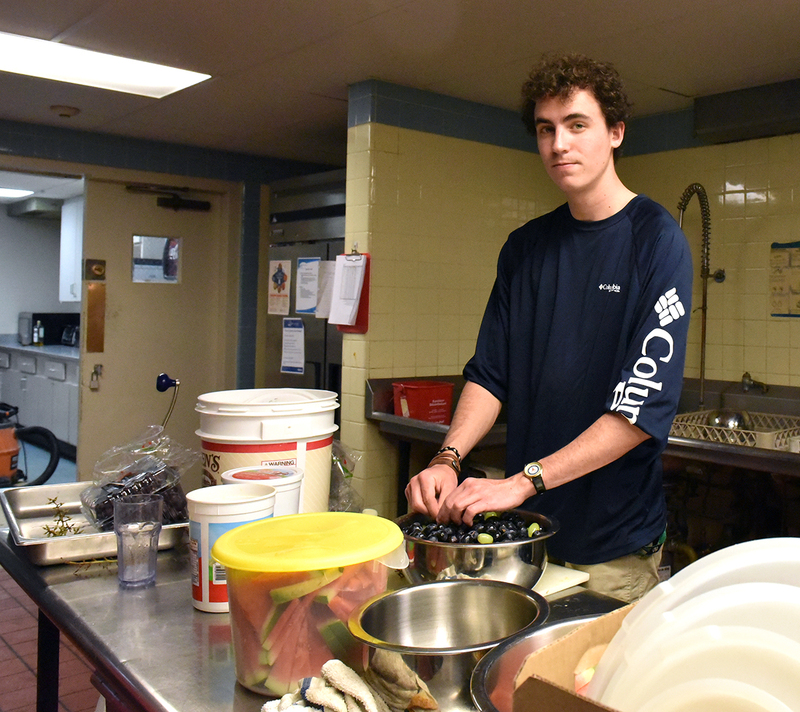 He followed Erik both summers, traveled to Washington, DC, and has assisted with meal hosting every year. There is a six-year age difference between Erik and Jacob. Erik never pressured Jacob to join Pi Kapp. He wanted Jacob to make his own decision – be his own person. I was thrilled when Jacob said he was pledging. 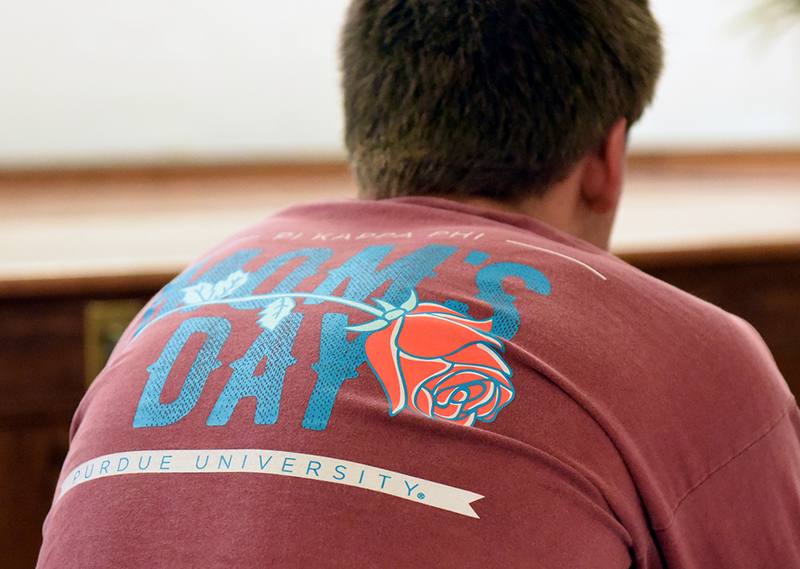 I’ve seen the impact this fraternity and its philanthropy has had on many young men. I am proud that both of my sons are part of an organization whose mission is to develop and encourage service to others and the vision of putting service before self are truly embraced. I love that Erik and Jacob are brothers with an Omega Pi Kapp bond. And I get to hang out with my adult children on Moms Day! It’s a good thing he’s not exactly like his older brother, Erik, who had a tendency to run around the fraternity house naked. That’s good Jacob didn’t inherit that trait from his older brother. I’d like all the first-time moms to stand and be recognized. We’re glad you are here and I’m sure all this activity today is a bit different than you expected – in a good way. And being an advisor, I would be remiss without giving you some advice. We love when you come when you are invited. However, take note and please don’t come unannounced. Now, I want all the moms to stand and be recognized. Again, thank you for your presence today. It’s not a moms day without you. Now, will the first-year moms please be seated, I want to see the seniority here. Now second year, now third year, now fourth year, now fifth year. We have three sixth year moms. Thanks, and congratulations. I am very proud of the accomplishments of these men – something I don’t often say in private, but do a lot in public. I thought I would spend some time letting you know what makes this chapter so strong on this campus. 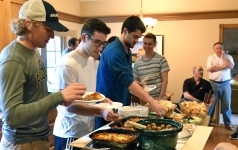 The simple part is this – recruit quality men, have good leadership and programming. The hard part is innovation and execution. We have to keep re-inventing what we do as fraternity and then making the plan happen. It has happened a lot over the years and is particularly true this year. Almost every event that you heard Nate and Drew talk about is an improvement over the past. You add something here, expand something there and make it happen. You are about to see in the upcoming slideshow many events from the chapter during the school year. 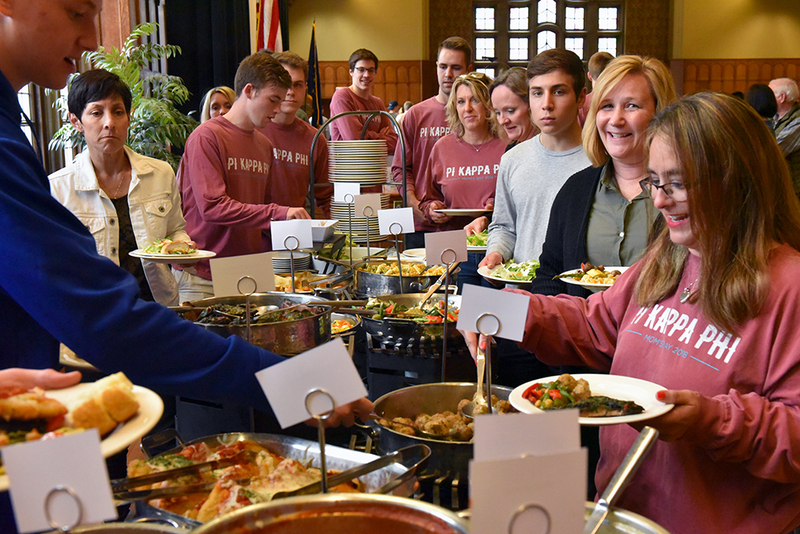 All these events – Pi a Pi Kapp, bike-a-thon, Arctoberfest, second chance prom, Lafayette Jeff relationship, War of Roses and Pi Kapp 100 – were created by chapter members. They were the innovators of their time and the execution is of this time. Typically, I try to keep the annual end-of-the-year slideshow to eight minutes or less. I could not do that this year; they’ve done so much. It’s 11-minutes, so sit back enjoy and recognize just how much these men have done this year. 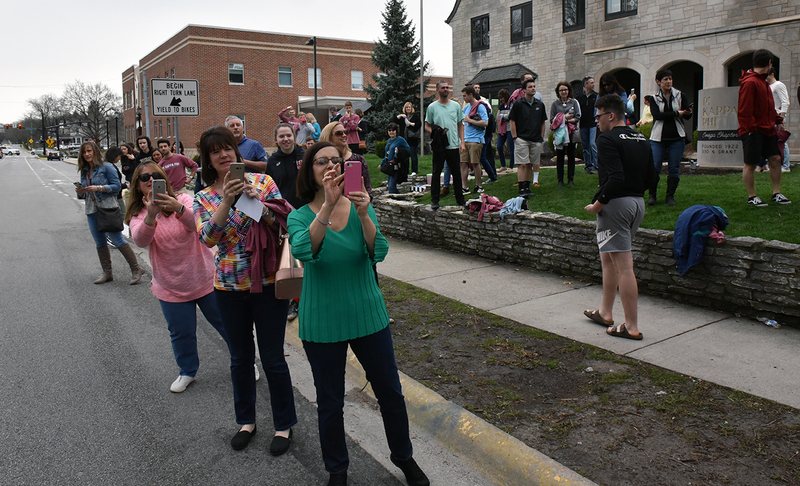 Shows 11-minute slideshow review of 2017-18 school year. Now, I have the distinct pleasure of introducing our keynote speaker, Basil Lyberg, CEO of the Ability Experience. He’s been with Push America/Ability Experience for 12 years on and off. 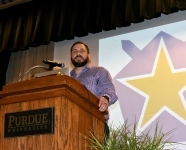 He spent six years as executive director of 24 Hours of Booty, a Livestrong agency, which is a national advocate for people around the world with cancer. One of the beneficiaries of the now what’s called the 24 Foundation is the Simon Cancer Center at IU Health in Indianapolis. He’s been CEO of the Ability Experience since March 2015. 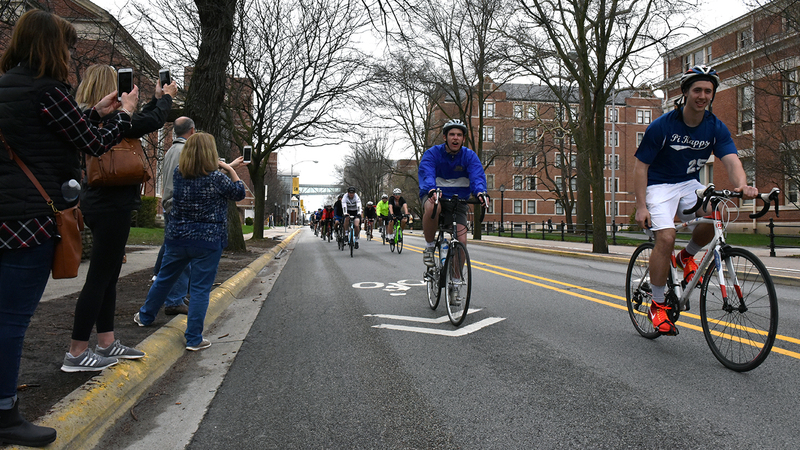 He, and chapter alumnus and Ability Experience staff member Mike McBride who is with us tonight, also were virtual Facebook riders for our Seventh Annual David Feltner Memorial Bike a Thon. They both rode in the Pi Kapp 100 today, too. Please join me in welcoming Basil Lyberg to the stage. The mission of The Ability Experience is to use shared experiences to impact people with disabilities and develop the men of Pi Kappa Phi into servant leaders. In my role my mission is to ensure that more Pi Kappa Phis have the opportunity to be impacted by someone who has a disability. I want every man who walks through our doors to have an Ability Experience experience. Omega has been a leader in shared experiences for a long time and I am honored to stand before you today. So to begin, I want to thank you for all the work you put into making Omega one of the top Ability Experience chapters and one of the top Pi Kappa Phi chapters in the nation. This past week, I had a chapter brother pass away. It is definitely sad, but along with our faith what has provided so much comfort is the impact he had in his time with us. His name is Rusty Higgins. Rusty was blind. When our chapter was small and looking to dig into the Ability Experience we went out to Disability Services to find out if we could help out in any way so they told us Rusty needed some help getting to class and taking notes. So we took his class schedule, assigned brothers to pick up, take him home, sit in class and help with notes. As we got to know Rusty, we realized what a great guy he was and offered him a bid. Rusty’s experience was probably just like anyone else’s. 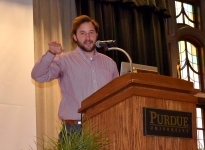 He led committees, was a voice at chapter meetings. One time, we had a recruitment event where some potential new members got there early so Rusty gave them a tour. As they walked around the lights in the house were off in many of the upstairs rooms and they were really confused until they figured out Rusty was blind. They were amazed that Rusty could give a full tour even sighting things on the wall and not miss a beat. We took Rusty driving, taught him to ride a bike, we’d shoot baskets. There is no doubt Rusty had a better experience because of Pi Kappa Phi. But there is also no doubt that my chapter brothers were impacted by Rusty tenfold. To see how hard Rusty had to work to take notes and study for classes. 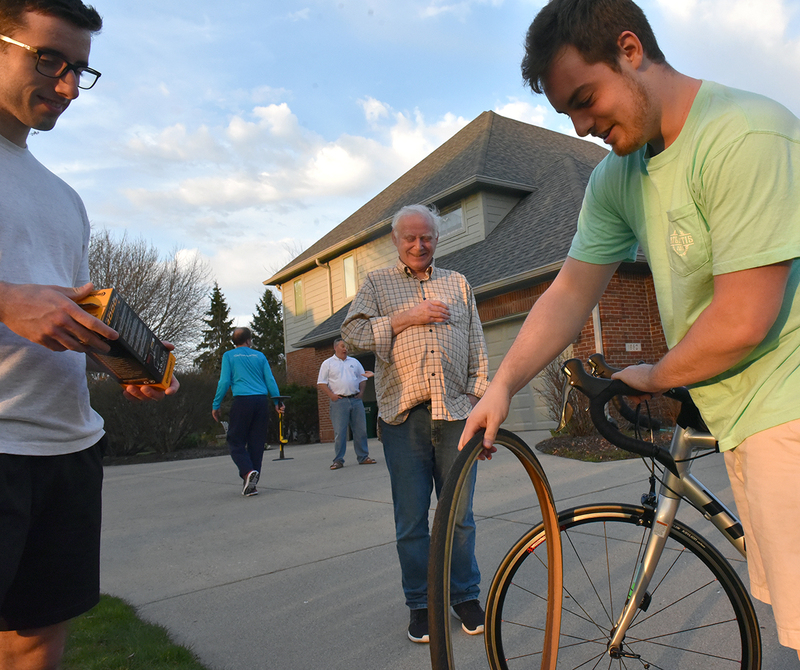 To watch him coordinate his schedule to get assistance from the chapter to make sure he could make it to classes, study sessions, committee meetings and other activities he was involved on with campus. It was the ultimate shared experience. For Omega, you have a long standing tradition of shared experiences. Your work at Lafayette Jefferson High School is among some of the most impactful I have seen. Between the time that you give, and the resources you provide through your Circle of Giving grant, you are impacting the lives of those students. You are also providing non-disabled peer interactions that provide tremendous value. Just like the time I was able to spend with Rusty impacted my life the time you are spending at Lafayette Jefferson High School and I would be remiss if I didn’t mention the Arc of Tippecanoe is impacting you tenfold. Right now it is probably something you feel good about and enjoy doing, but what you are doing is building character. When you sit down for your post-grad interviews, there is no doubt they will want to know about your technical background. But what will seal the deal for you is the man you have become in these four years. Over the years, you have seen this character being built through these shared experiences in the chapter. 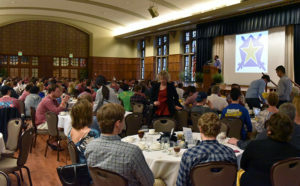 I have experienced it with meeting some of your older alumni who I have kept in touch with over the years; Andy Parker, Phil Leslie, Brian Carlson who all attribute their career success to their time at Omega and on Journey of Hope. I work side by side with (national staff members) Brent Grunig and Mike McBride. 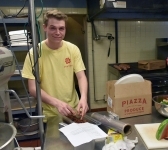 Mike, I am sure to the chagrin of his parents, decided to put his career in engineering on hold to pursue nonprofit work with the Ability Experience and his ability to meld the two is allowing him to have a huge impact. As I close, I have heard about Mom’s Day weekend for years. My old boss Chad Coltrane came up here and had a great experience and I can tell you that this has exceeded all of my expectations. But I can’t leave here without taking a second to thank all the moms for their work in raising some tremendous young men. You set them on this path and put service on their hearts. Thank you for all you do to continue to love and support your sons. And to the men in this room, I hope you always take the time to make room for service in your lives. For some of you, that will mean taking part in a construction event. 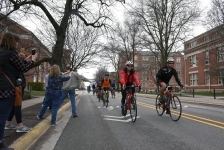 For others, that will be riding in Journey of Hope or starting a Build America Tradition for Omega. For all of you, I hope you work to all find ways to serve your community and let your actions be the voice for those who need it. Thank you so much for the invitation to speak. 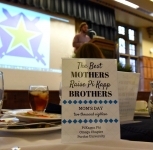 Let’s raise our glasses to say thank you to all the moms for your love and support, to my good friend Rusty and the men of the Omega Chapter of Pi Kappa Phi.